Recently, I drove from Santa Fe, New Mexico to New Orleans, Louisiana. Let me tell you what I saw on this trip. I saw Texas, and lots of it. And in case you didn't know it, when you cross the border into Texas, you are entering Kolache Country. In case you've never had the pleasure of eating a kolache, or if you don't in fact know what they are, please, allow me to briefly educate you. 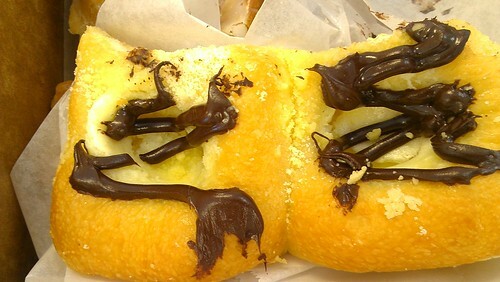 Kolache, which may also be spelled kolace, kolach, or kolacky, is a light, pillowy yeasted pastry which is only lightly sweet, and is filled in the middle with a dollop of any number of different fillings, from poppyseed to apricot to cherry to fig to chocolate or cream cheese. The kolache is Eastern European in descent. I hear that in Europe it originated as a wedding dessert. They traveled to the US with Czech immigrants, who started moving to Texas in a big way in the early to mid 1800s. It seems to have been one of those things where a small group came first and promoted the opportunities stateside in a big way for friends and family back home, which led to more immigration. The kolache of course evolved and adapted once it got to Texas. For one thing, rather than a wedding treat, based on my Texas observations, they're primarily an A.M. treat. I'll pause now to ask: want a kolache recipe? This one, on Homesick Texan, looks mighty fine to me. But really, you should get yourself to Kenner's. 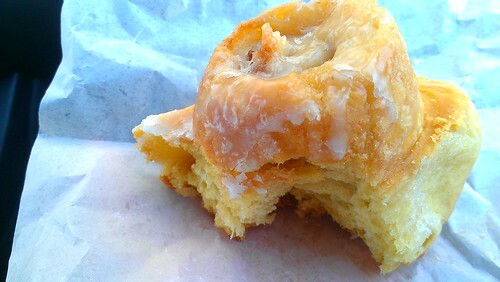 It was just after noon when we pulled in to Kenner's Kolaches in Arlington, Texas, but we hadn't eaten yet so this was breakfast, making it still a valid A.M. treat. 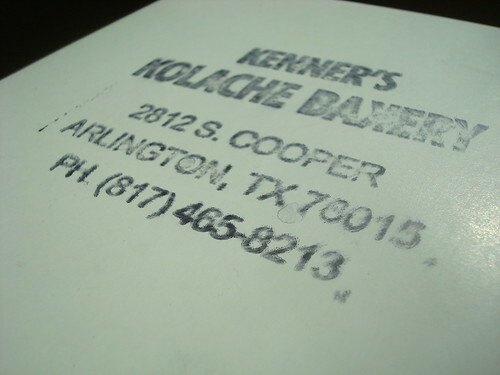 Kenner's has been making kolaches since the mid-1980s, but it's so old-school that I wouldn't have been surprised to hear they'd been at it since 1947. I say this as a compliment. When you enter Kenner's, you'll be assaulted (but in a good way) by a warm, yeasty smell. You will want to live in that smell. The two employees were so friendly, possibly owing to the fact that for several hours a week, they do live in that smell. They were happy to explain everything in the bakery case. First, the kolache. They had them in a myriad of flavors: apple, apricot, bavarian cream, blueberry, cherry, cream cheese, strawberry, strawberry cream cheese, peach, poppyseed, and raspberry. They were described as pie filling-esque, "but good stuff". Their kolaches are like eating clouds. If clouds were light as air but also stuffed with stuff. You inhale, and it's practically gone. But they're so good. Two is better than one for sure. They also have some savory kolaches, including sausage, bacon and cheese, and the related (in that it uses the same dough but is presented pig in a blanket style) sausage roll. Rounding out the offerings? Cinnamon rolls ("best in town! "), and Danish Melt-a-Ways. Let me take a moment to tell you about the melt-a-way. If I were pressed to describe them, I'd say they're like a morning bun on buttercream-laced crack. I told myself as I took the first bite "only eat half. pace yourself for other sweets." Yeah right. I inhaled that thing, with my only regret being that it was gone so fast. 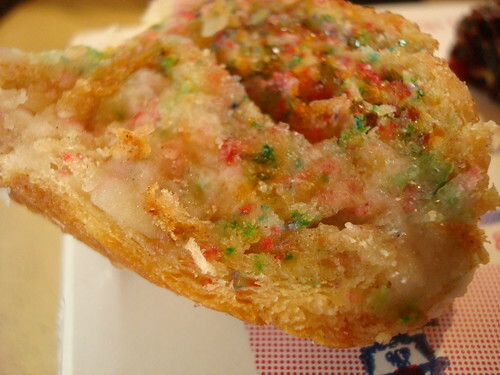 This is like a down-home version of what I imagine a cronut would taste like--flaky, creamy, delicious. And in this case, glazed. They also had some pastry thingies (I know! I get paid to write!) 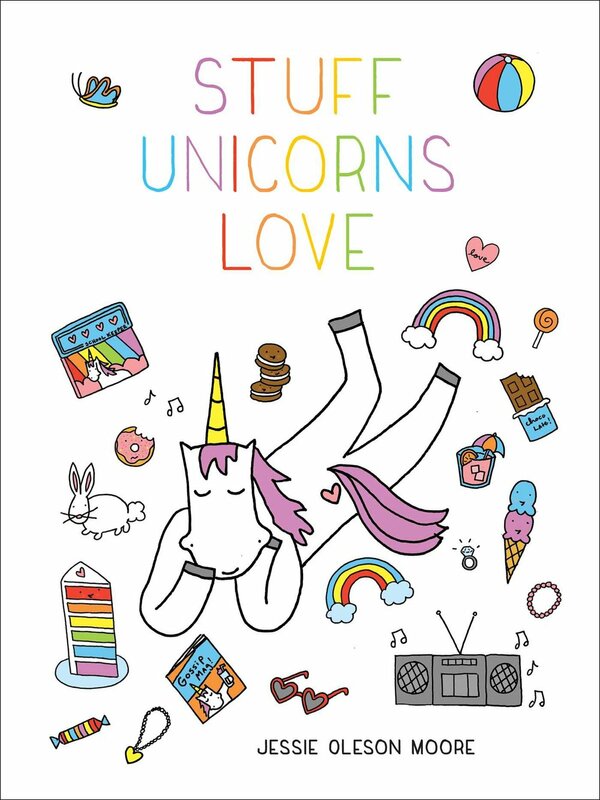 in the case with rainbow sprinkles. "It's an experiment" said the employee, who said that she'd made them with leftover cinnamon roll dough and put sprinkles on to entice children. "It's to discourage them from using the d-word." The d-word? I was confused. 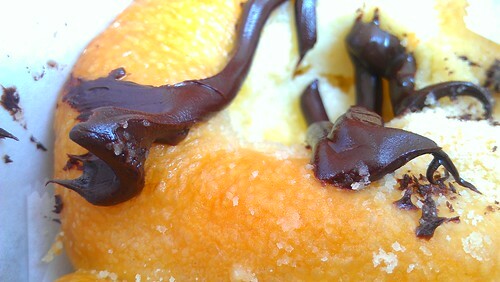 She whispered, conspiritorially, "doughnut". And that was that--subject closed. There are no doughnuts on site or in sight here. 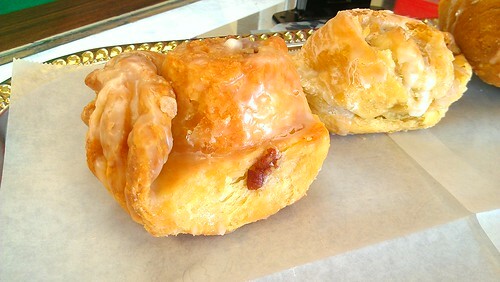 But once your mouth is full of kolache, I donut think you'll care too much. 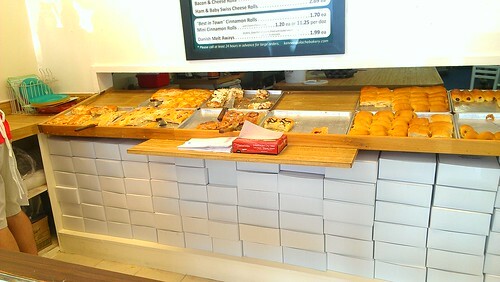 Kenner's Kolache Bakery, 2812 South Cooper, Arlington TX. Online here.